Sadie Coles HQ is delighted to present an exhibition of new works by Uri Aran. 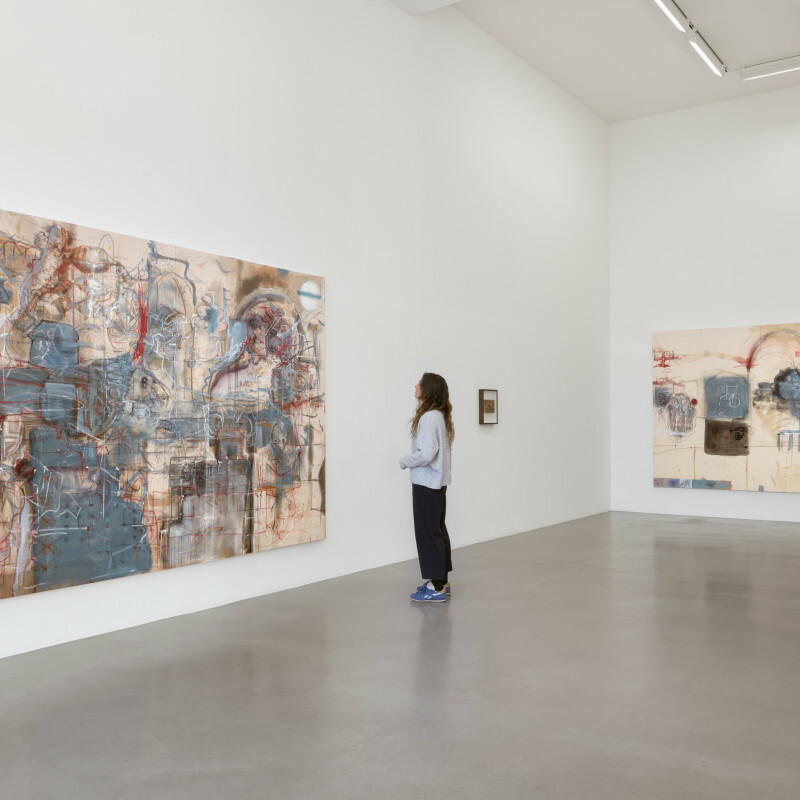 The show centres on two paintings in which the artist has worked on an unprecedentedly large scale. Employing a diverse array of materials, the paintings pursue the ideas of gesture, genre and language that have recurred throughout Aran's practice by means of a newly expressive painterly language. The works extend his use of readymade materials and forms - each is made on an unprimed canvas that he found left behind in his studio. Embracing a cinematic scale, Aran has produced two identically-sized works in which marks and motifs spread across an expansive ground. Paint, oil pastel, graphite, wax and various household materials accumulate into elaborate systems which carry echoes of both gestural abstraction and minimalist painting, while also retaining the intimacy and tentativeness of the artist's smaller works. Each piece collapses together painting and drawing to convey the impression of thoughts channelled directly onto canvas. Evanescent formations rendered in grisaille tones hover on the brink of decipherability, shifting between hard and soft focus, with the untreated fabric (a literal 'blank canvas') enhancing the sense of directness. Echoing the temporal slippages of film, the works glance simultaneously backwards and forwards - implying both reanimated histories and germinating futures. The two new compositions express a marked contrast: one constitutes a dense layering of tonal and linear elements, massing into a coherent architectonic system comprised of positive and negative space, whereas the other offers a comparatively sparse and disjointed scheme, with pools of pigment and grid-like structures dispersed across the monochrome ground in the manner of an elemental landscape, fluid and decentred. The poetic or narrative quality that underscores much of Aran's work - whether his drawings, sculptures, performances or videos - is expressed here as a kind of poème simultané of chimerical and anthropomorphic images, akin to the unresolved phantasms that inhabit the 'mind's eye'. In a new series of works on paper and board, Aran pursues ideas similar to those of the large-scale paintings, layering expressive and semantic elements into condensed compositions that vary between dense systems and note-like intimations. Within and between these pieces, concepts of image, materiality, genre and notation are simultaneously invoked and deconstructed. Images are alternately implied and broken up, disjoined into corpuscle-like fragments or layered into semi-abstract meshes. In certain cases, fragments of text offer a verbal equivalent to the multiple gestural and pictorial 'annotations' of the works, suggesting diaristic fragments or disarticulated thoughts. Aran's small-scale repositories of marks evoke categories as diverse as linear cartoons, woodblock prints and Gutai abstraction - while resisting outright reference or quotation. In this way the works imply a liminal space, equivalent to thought itself in its conjunction of conscious and reflexive impulses. Echoing and redoubling one another, they imply a larger narrative structure or chain of episodes. Aran’s individual works point always towards a larger ‘megatext’ or never-to-be-completed whole – referring to each other with an internal logic that reflects that of language or music. Uri Aran (b. 1977, Jerusalem) lives and works in New York. He graduated from Columbia University in 2007. He has exhibited internationally with solo presentations including Uri Aran: Time for an Early Mark, curated by Moritz Wesseler as part of 'curated by vienna 2017', Christine König Galerie, Vienna; Two Things About Suffering, Sadie Coles HQ, London (2016); Mice, Koelnischer Kunstverein, Cologne, Germany (2016); Puddles, Peep-Hole, Milan (2014); Five Minutes Before, South London Gallery (2013); and here, here and here, Kunsthalle Zürich (2013). He has been included in group exhibitions including Platforms: Commissions and Collection, Walker Art Center, Minneapolis (MN), USA (2019); 99 Cents or Less, Museum of Contemporary Art Detroit, Detroit, USA (2017); Question the Wall Itself, Walker Art Center, Minneapolis, USA (2016); Take Me (I'm Yours), Jewish Museum, New York (2016); Walter Benjamin: Exilic Archive, Tel Aviv Museum of Art, Israel (2016); do it, various international venues (2013-15); Liverpool Biennial 2014; the 2014 Whitney Biennial, Whitney Museum of American Art, New York; and The Encyclopedic Palace, 55th Venice Biennale, Venice (2013).